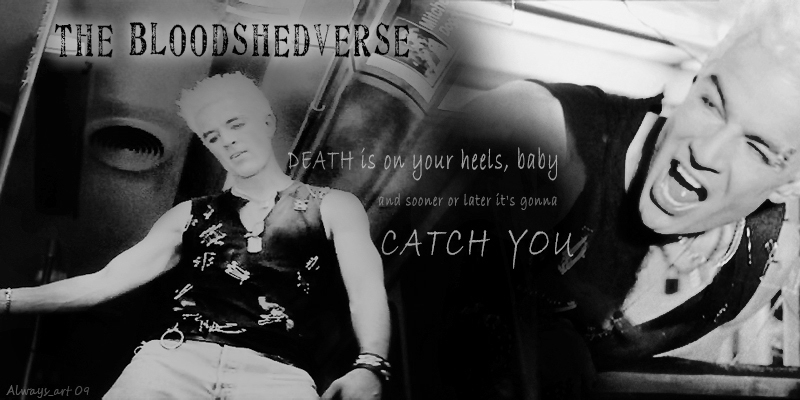 If you register and use an account, on the Bloodshedverse, all the information you post will be accessible to accessible to the general public. This includes any personal information you include in your posts and stories – but not your email address, unless you choose to mark it as publicly visible. Even if you don't register, but post anonymously to the forum or leave a guest-review, we may collect personally identifying information such as your IP address and make use of it in the case of complaints. The Bloodshed-Team will be able to access your email address even if you marked it for private use only, and may use it internally to contact you in case of problems or complaints. Furthermore, if you select stories or authors as favourites, you will automatically receive emails about story updates. The same is true for an author who choose to receive emails about reviews to their stories. To stop those emails you can simply deselect the favourites/un-check the setting for review-emails. The Bloodshedverse is hosted on a third-party server and the hosting company may store personally identifying information in their log-files and backups. By registering an account and uploading your work, you consent to our storing your work and information, as well as the display of all your posted work and information to the general public. That consent is necessary, since the whole purpose of uploading your work to the Bloodshedverse is to make it available to others. By posting a review to a story, you consent to that review being visible to the general public,; and if you were logged into your account when you posted it, for the review to be associated with your user-name. This consent is needed, since the purpose of the review is for everyone to be ale to read your opinion on the story in question. When you post in the forum, you consent for the post to be visible to the general public or other Bloodshedverse members depending on the section of the forum you post it in. If you post while logged into your account, the post will be linked to your user-name and all other work you posted under that name. This consent is needed because the forum is a place for public discussions and conversations and the purpose of your posting there is for others to read your comments and reply to them. Even if you are not logged in and don't post any reviews or anonymous forum messages, some information like your IP address may be stored temporarily in our log-files for statistical purposes. We will not sell, rent, trade or otherwise provide your information to any third party unless we are legally compelled to, or cooperating with law enforcement. We will not use your personal information to market any products or services to you, nor will we provide then to a third party to do so. You are able to delete some of what you posted yourself, such as any stories you uploaded. Should you wish for your remaining information and account to be deleted, please contact us under del *at* bloodshedverse *dot* com (please use this address ONLY for this purpose, it is not for general communication. Forum posts and reviews are stored separately from your account, so if you wish for those to be deleted as well, please make sure to mention if when you make your request. Alternatively we can anonymize them by removing your user-name, if that is your preferred option let us know.